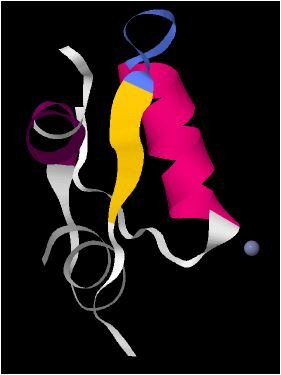 Often, pharmaceutical formulations contain therapeutic proteins at relatively high concentration. Under such conditions, the stability of the protein as well as the formulation overall is of significant concern. 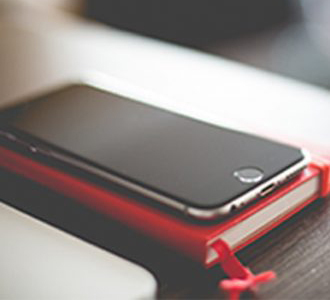 Great effort is invested in optimizing stability, and particular attention goes to the choice of buffer components. Various components might form part of the ‘final’ recipe including cosolvents (such as polyethylene glycol (PEG), glycerol, ethanol) to reduce the dielectric constant of the buffer and influence electrostatic interactions, chelating agents (citric acid or citrate salt buffers, ethylene-diamine-tetra-acetic acid (EDTA), tris(hydroxymethyl)aminomethane (TRIS), tartaric acid) and sugars (such as trehalose, mannitol, sucrose, maltose) to inhibit or reduce oxidation. Various amino acids (arginine, glycine, lysine) and surfactants (polysorbate) may also contribute to an overall anti-aggregation action. 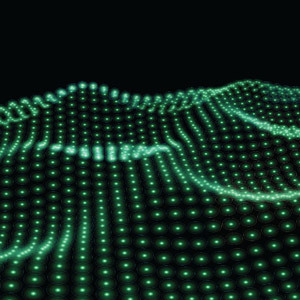 In dynamic light scattering (DLS) the level of intensity fluctuations is analyzed to find the hydrodynamic size of molecules. 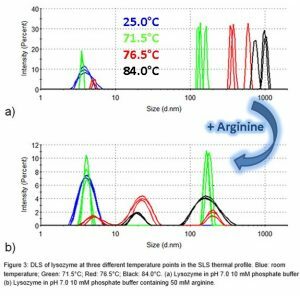 Since the size of molecules increased upon aggregation, DLS can be used to study what happens to a particular biopharmaceutical formulation when under thermal stress: The size of an aggregated protein is larger than the non-aggregated molecule. 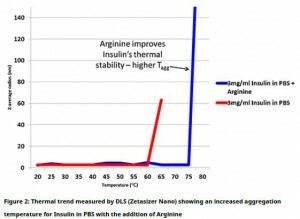 When Arginine was added to a preparation of insulin in PBS, the aggregation temperature increased markedly by 15° from 60° to 75°C, as shown in Figure 2 taken from Malvern application note ‘Assessing the self-association and stability of Insulin under varying formulation conditions‘. 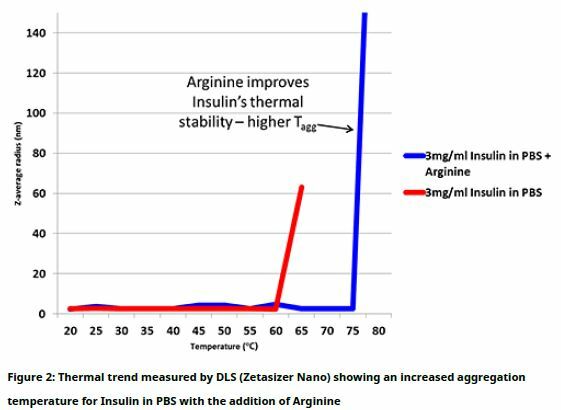 Clearly, the addition of the amino acid Arginine had a significant effect on the thermal behavior as observed by light scattering as a function of temperature. Thus when trying to assess optimal formulation parameters, additives and excipients, the study of the thermal dependence of dynamic light scattering can be a valuable tool. What is the aggregation temperature? At higher temperature the thermal energy in the sample system is higher, leading to faster diffusion (and thus more chances for molecules to “run into each other”). In addition, the likelihood of any intermediate moderately stable structural states is increased. Thus as temperature is increased the propensity of sticky molecules to attach to each other is increased. At the onset this leads to the formation of dimers and higher order oligomeric compounds and can be seen by observation of dynamic light scattering as a function of temperature. This transition temperature is also called the aggregation temperature and it is not the same as the thermal denaturation temperature which may be obtained by circular dichroism (CD) or differential scanning calorimetry (DSC). Typically the aggregation temperature is lower than the melting temperature Tm or denaturation temperature Td. When 50mM Arginine was added to a 2mg/mL lysozyme sample prepared in 10mM PBS, a slower onset of aggregation was observed. 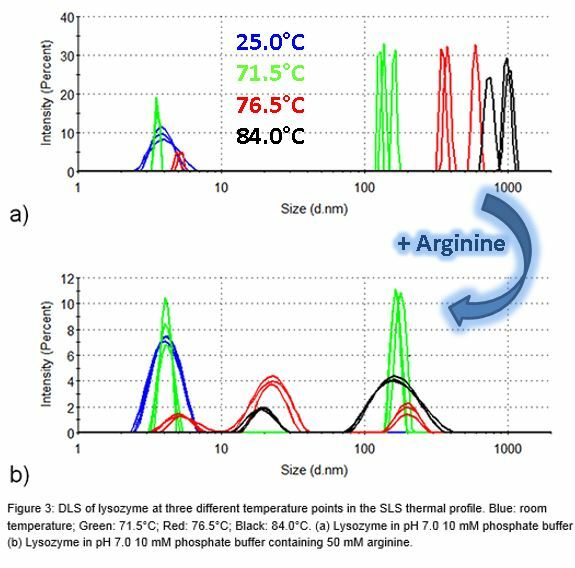 At 84° (significantly above the aggregation temperature) the hydrodynamic size of aggregates is consistently smaller when arginine was present. Since the zeta potential of lysozyme below the aggregation temperature was not strengthened by arginine, the stability increase appears to not be charge dominated. 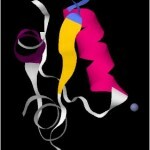 Instead, the conclusion in the Malvern application note ‘Investigating the effects of excipients on the earliest stages of aggregation – Aggregation inhibition by arginine‘ states the hypothesis that arginine may bind to the hydrophobic areas of protein which become exposed upon denaturation, thus potentially acting as a charged protectant of these aggregation hotspots.